The headline for the August 3rd Des Moines Sunday Register was, “Jordan Creek Mall Seeks Fresh Feel.” The article talked about the changes in shopping since the mall was opened. People are shopping online more, leading to awkward conversations like the one above. I was not excited when they opened, because I shop from the clearance racks. I knew it would be several months before they started to clearance things out. At the time, I looked forward to receiving catalogs from Coldwater Creek. I used them to help me make outfits with the clothes I already owned. I signed up for Hukkster.com the day before they closed. I was really frustrated as I can only wear 100% cotton and finding items made of that material is daunting. I can go through an entire seasonal line and not find anything to buy. Hukkster.com let you mark items you wanted to purchase and they sent you an email when it went on sale. Alas, they closed shop. I moved over to “WorthIt.com,” a similar service. They send an email every time the item you desire is reduced in price. You purchase it when the cost is low enough to be worth it to you. Shopping online is frustrating as the color is not always accurate and it is difficult to see tiny details or the description is too vague. The best money I have ever spent was $30.00 when I became a member at missussmartypants.com. She sends a weekly post teaching about one area of fashion: “What jacket should you buy,” “How to dress nicely and stay cool,” “What is your perfect skirt length,” etc. I know my numbers and can tell at a glance whether the dress will be the most flattering length for me or not. The models used are very tall and you can’t always judge a dress by where it hits their knee. We must remember we are buying clothes for the size we are right now and our bodies are unique. What looks good on you may not look good on me. Missussmartypants.com has you pick your body type, or she will help you choose the correct one, and she will do your seasonal colors for a few dollars more. She tells you what to look for and what to avoid. Each week she shops at one store and puts suggestions on your page for your body type. She shows which items she would put together out of the ones on the page. When shopping for clothes it is best to be specific. Right now, I am looking for a white blazer and a denim blazer. I don’t look through all of the clothes offered on a website. I type blazer in the search box and I have an answer rather quickly. We don’t need more clothes; we need flattering clothes that fit our bodies correctly. Missussmartypants.com can help. 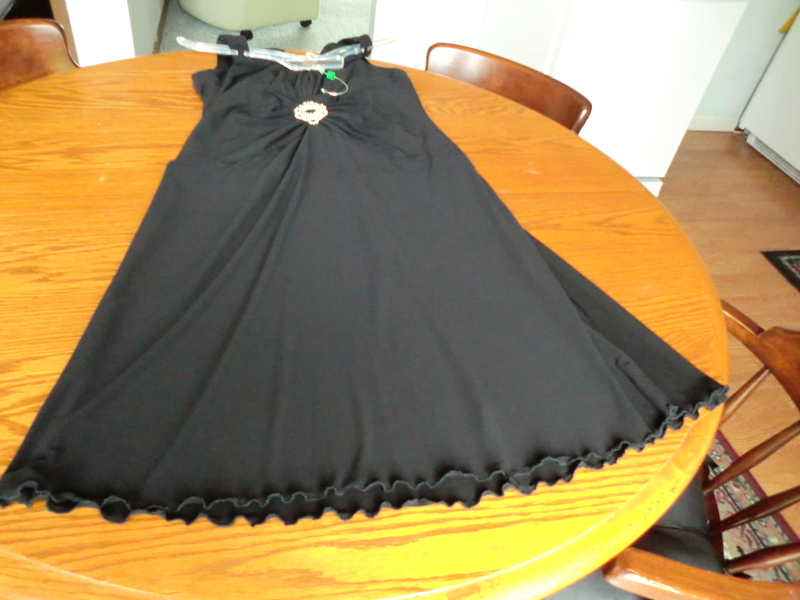 I used the zigzag stitch to lengthen my little black dress. This entry was posted in Be Prepared, Clothes, Money Saving Ideas, Purchasing and tagged Be Prepared, Clothes, Money Saving Ideas, Purchasing by Frugal Fish. Bookmark the permalink.